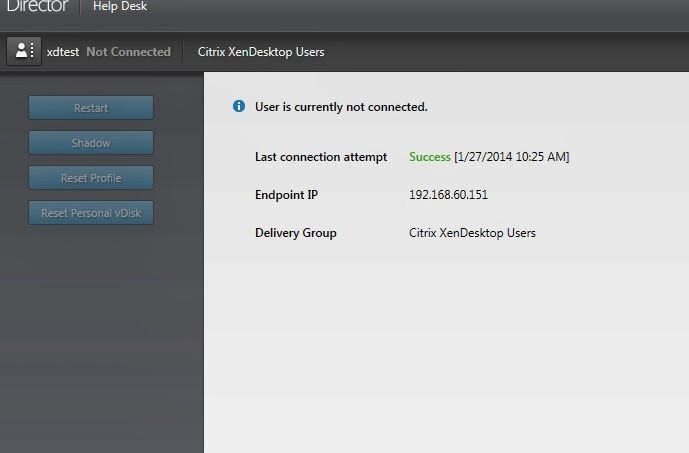 In the midst of the release of Citrix XenApp 7.5 (didn’t we say goodbye a few weeks ago to that??) I’m doing a follow up on my blogs about XenDesktop 7.x. In this blog I will show you how the Helpdesk Administrator role is implemented and what the service desk is able to do when assigned. 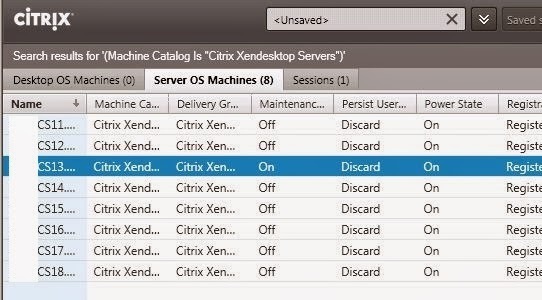 In this blog I still work with the App edition of XenDesktop which in March will change to XenApp in some sort of way… how this will take place and how it will look still has to be determined. My guess is that it will be more a naming/license change than anything else but time will tell. Before your service desk can assist users working on a desktop you need to assign a user the Helpdesk Administrator role. This assignment is done from the Studio console on the broker. By default there are a few roles available, for most standard tasks these roles will be sufficient. If the standard roles are not sufficient you can create a role yourself, for the menu you can create a role and a scope to which the role will be applied. Be careful doing that for you might give your service desk user a lot of power. 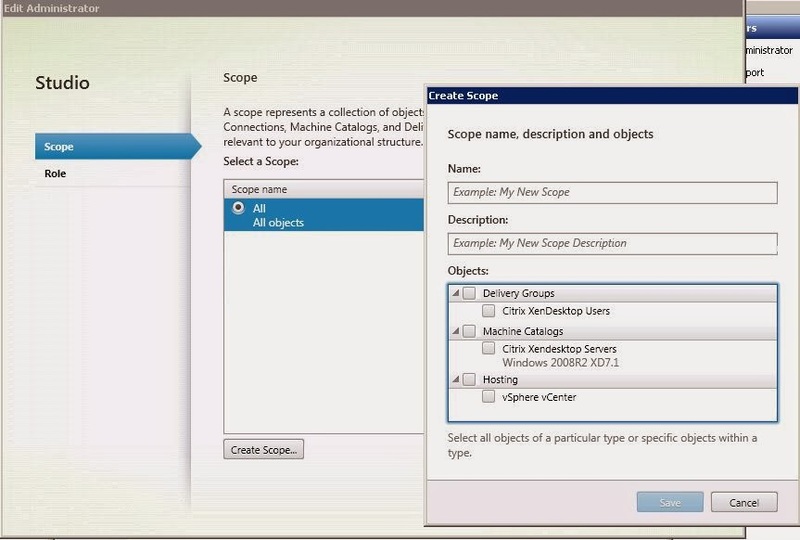 If you look at the scope options you can select from the Delivery groups, the machine catalogs and the hosting side of the environment. I selected all for this customer for they have a small IT department. Same goes for the Roles that you can assign, you can select from a long list of specific areas and select whether users have rights there. I didn’t create a role and selected the standard Helpdesk administrator role. I assigned a user to that role and logged on with that user to the Desktop Director. After you log on with the helpdesk administrator user they will be presented with this screen, clear as water. You can search for a user and it will help you searching… perhaps it would be nice to have a list of all users also somewhere for a service desk user but that might just be. I searched for the user and when I select the user this screen is selected, the user is not yet connected so nothing is shown at this moment. Let’s start up a session with the user and see what we get. 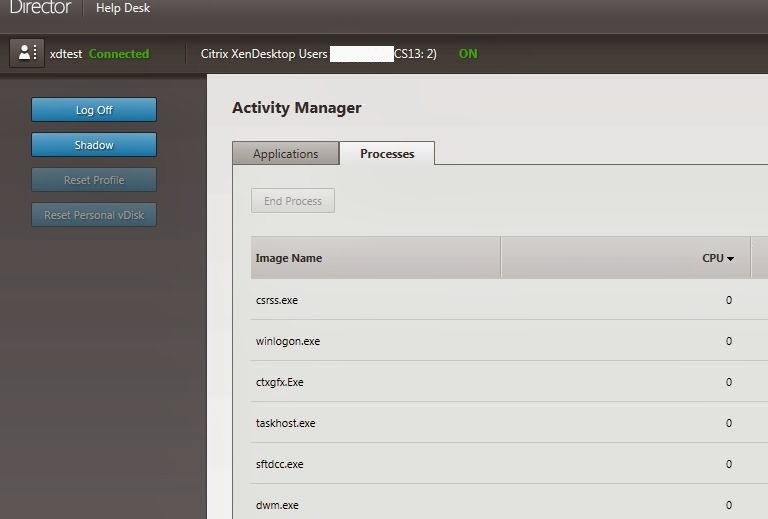 The Director screen changes after a minute when the user is logged on, the processes are shown in the list. When the user starts and application, this is shown in the list of application. The buttons Log off and Shadow are available at this moment, shadowing has been described in my previous blog. In that blog I wrote about the machine details that we’re shown in that screen and when you are an administrator you can see the option to shutdown a machine. 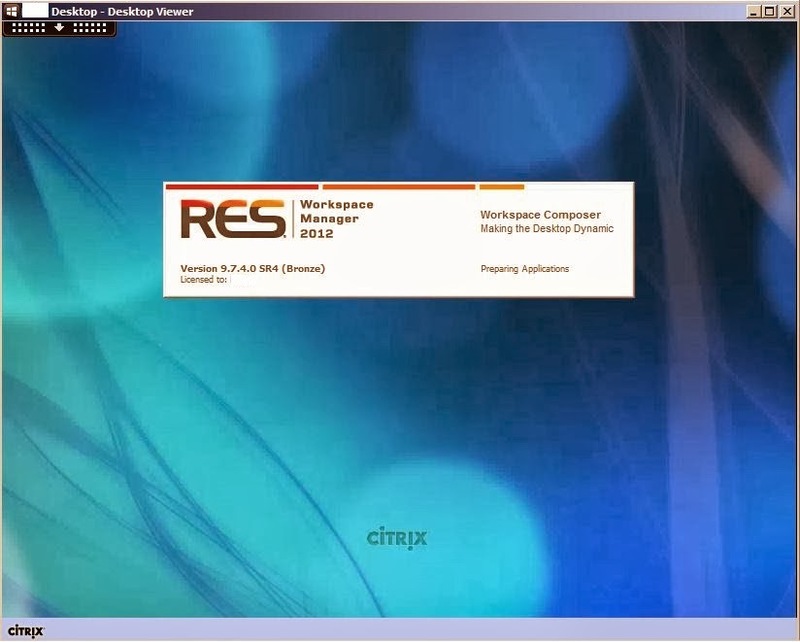 In an Xendesktop environment that is a nice feature for it’s a single user machine. 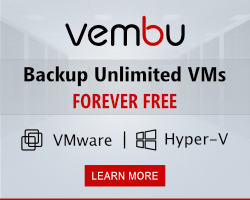 With a App edition (XenApp, Presentation server, Metaframe or Winframe) machine (making sure I’m covered for the coming changes 🙂 ) it’s a multi-user machine and you don’t want to shut it down just like that. When the user has Helpdesk administrator role assigned the options are grayed out. 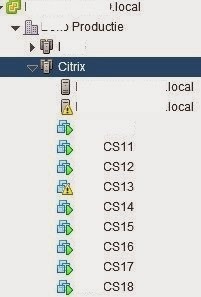 The option for maintenance more are not… but surely you can put a Citrix server in maintenance mode with this limited role.. The only thing left for the service desk user is the average logon times for the user it is helping.. just a nice overview that might help when talking to the user. So this is it, blog finished??? don’t think so… if you read my blog you noticed that I was wondering if you could bring down a machine from the user perspective console (read again from the user perspective part of the console where you shadow the user or reset their session) even when the machine is a multi user machine. Let’s log on again to a session and log on to the director as an administrator… the power down options are available now… surely this will not work. 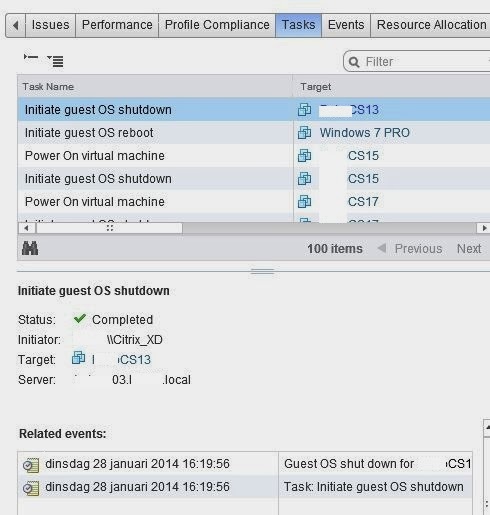 When looking from a vSphere point of view I noticed that the Citrix server has been shutdown, you can see the shutdown initiation… euhh may I suggest a small change in the features of this console option, I don’t want the possibility to have this option when I’m looking at a user session. Lucky the server will be restarted automatically but I’m not so sure your users would be so happy with this action.. The management options for service desk with the standard role is sufficient, personally I would like to have a session overview from which you could select users to help and shadow. The customization is nice and makes it possible to create a custom role on a custom scope. 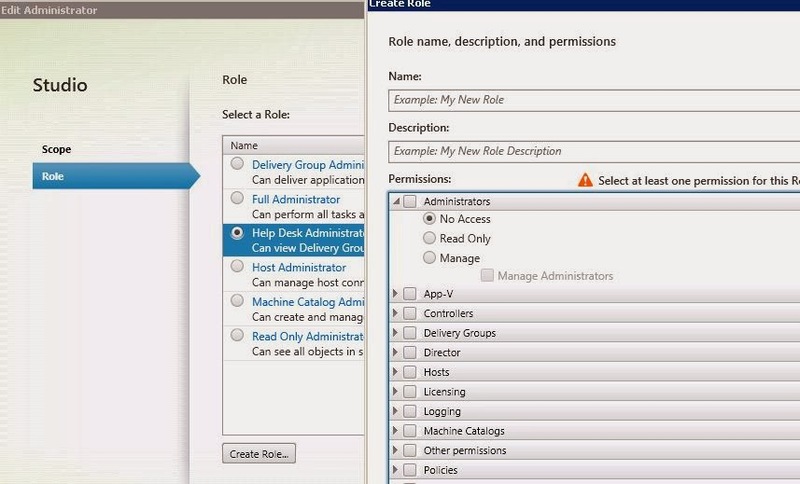 The options you have as an administrator when looking at a user session are a bit to much, user details in a multi-user environment should not have the option to shutdown the machine.. of course most administrators will know which user they are helping but in a mixed environment you might make a mistake and shutdown a server. Let’s wait and see how 7.5 is integrated and if anything will change with the console.